Theoretical Foundations: what is Mindfulness? Why Should Health care Professionals Practice Mindfulness? All chapters in this new edition are written by researchers with extensive clinical experience. Each chapter includes the conceptual rationale for using a mindfulness-based treatment and a review of the relevant evidence base. A detailed case study illustrates how the intervention is implemented in "real life," exploring the clinical and practical issues that may arise and how they can be managed. 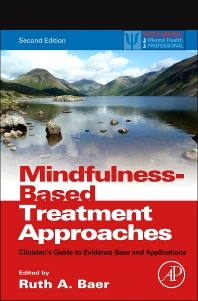 This book will be of use to clinicians and researchers interested in understanding and implementing mindfulness based treatments. Mental health clinicians in a wide range of settings, including psychologists, psychiatrists, counselors, social workers, and mental health nurses as well as researchers, teachers, and academicians interested in mental health treatment. Ruth Baer is Professor of Psychology at the University of Kentucky. She has published widely on the assessment of mindfulness, mindfulness-based interventions and their mechanisms of change, relationships between mindfulness and other aspects of psychological functioning, and mindfulness and related variables in borderline personality disorder. She teaches and supervises several mindfulness-based interventions, including acceptance and commitment therapy (ACT), dialectical behavior therapy (DBT), mindfulness-based cognitive therapy (MBCT), mindfulness-based relapse prevention (MBRP), and mindfulness-based stress reduction (MBSR). Prof. Baer is the developer of the Kentucky Inventory of Mindfulness Skills and the Five Facet Mindfulness Questionnaire, and editor of two previous books for professionals: Mindfulness-Based Treatment Approaches: Clinician’s Guide to Evidence Base and Application, and Assessing Mindfulness and Acceptance: Illuminating the Processes of Change. She serves on the editorial boards of several journals and has presented many talks and workshops on mindfulness in the US and abroad. Her latest book presents a self-help approach to mindfulness for the general public and is published in the US as The Practicing Happiness Workbook: How Mindfulness Can Free You From the Four Psychological Traps that Keep You Stressed, Anxious, and Depressed, and in the United Kingdom as Practising Happiness: How Mindfulness Can Free You from Psychological Traps and Help you Build the Life you Want.